This image, without explanation probably looks like quite a frustrating moment in itself, the photo however represents for me quite a few more deeper misfortunes and frustrations. Mid 2009 all my camera equipment was stolen from my car as I went inside to pick up some more film. No biggie, all my stuff was insured, I lost some used film from a recent trip to the Arizona desert, but that is life. Unfortunately there was something in my camera bag that was a big deal for me and something that was not replaceable with insurance money... my fathers Olympus OM1 that he gave me and I subsequently fell in love with photography using. In my attempts to replace this camera which currently amount to 4 cameras I have managed to buy mechanical duds. This photo represents my latest attempt to replace the camera... this camera was described on the internet auction site as clean and in perfect working order. It was filthy, and most function were frozen and not working, the shutter would not fire and its lens was stuck on the front. 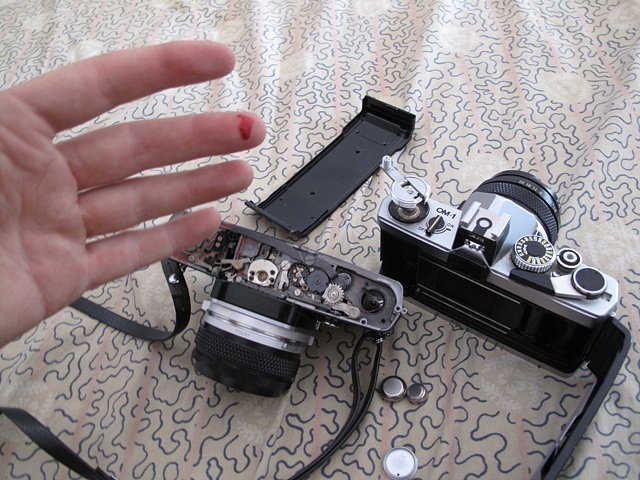 This photo was taken just after I sliced my finger open while trying to pry off its lens. I continue to look for a working replacement knowing all too well that even with a working camera I can never replace my fathers OM1 .